Water Filter Selection for Coffee Machines by Cang Li, Selecto, Inc.
offee is one of the most consumed beverages in the world. As a world commodity, coffee is second only to oil. It is a part of most everyone’s daily routine and helps them get focused for the upcoming day. Roughly 50% of the population, equating to about 150 million Americans, drink espresso, cappuccino, latte, or iced/cold coffee. Of these 150 million coffee drinkers in America, about 30 million of them consume coffee-related beverages on a daily basis. Activated catalytic carbon treated water: This method produces bettertasting coffee and prevents equipment corrosion from disinfectants. Granular carbon or carbon block filters generally remove bad odor and taste and leave the minerals in treated water. This would be the ideal water for bettertasting coffee and equipment production if the water is soft. However, this technology will not prevent the coffee machine from scale buildup if water is hard. 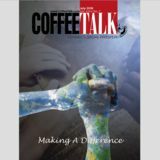 Specialty coffee sales are increasing by 20% per annum and account for nearly 8% of the $18 billion U.S. coffee market. At about 400 million cups of coffee per day, Americans are the leading consumers of coffee in the world. Currently, there are approximately 24,000 coffee shops across the country but statistics show that there will be over 50,000 coffee shops within the next few years. Activated catalytic carbon with nano-crystal scale control: Except for the benefits mentioned above for activated catalytic carbon treated water, nanocrystal technology controls scale buildup. The combination of catalytic carbon and nano-crystal scale inhibitors will balance taste with optimal maintenance requirements. Water quality is becoming increasingly important in making better-tasting coffee as well as protecting the coffee machine. Not only is it the main ingredient of coffee (~99%), but it is also key to bringing out the different flavors of the coffee bean. A perfect cup of coffee can be achieved by controlling the minerals such as sodium, magnesium, and calcium in the water used. Though hard water will generally produce a better-tasting cup of coffee compared to soft water, the minerals in hard water build up faster inside the coffee equipment and cause clogging in the pumps, boilers and valves, leading to higher maintenance costs. Furthermore, disinfectant could rust the metals and damage the parts of the coffee machine and has the potential to adversely affect a coffee bean’s flavor. 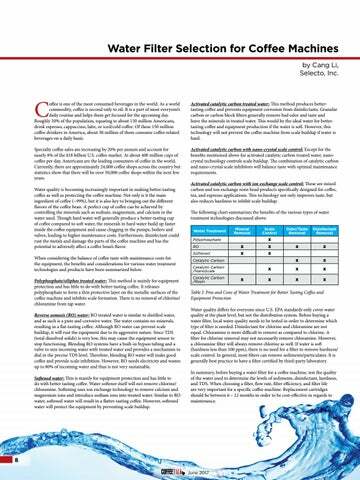 When considering the balance of coffee taste with maintenance costs for the equipment, the benefits and considerations for various water treatment technologies and products have been summarized below. Polyphosphate/siliphos treated water: This method is mainly for equipment protection and has little to do with better-tasting coffee. It releases polyphosphate to form a thin protective layer on the metallic surfaces of the coffee machine and inhibits scale formation. There is no removal of chlorine/ chloramine from tap water. Reverse osmosis (RO) water: RO treated water is similar to distilled water, and as such is a pure and corrosive water. The water contains no minerals, resulting in a flat-tasting coffee. Although RO water can prevent scale buildup, it will rust the equipment due to its aggressive nature. Since TDS (total dissolved solids) is very low, this may cause the equipment sensor to stop functioning. Blending RO systems have a built-in bypass tubing and a valve to mix incoming water with treated water and provides a mechanism to dial in the precise TDS level. Therefore, blending RO water will make good coffee and provide scale inhibition. However, RO needs electricity and wastes up to 80% of incoming water and thus is not very sustainable. Softened water: This is mainly for equipment protection and has little to do with better tasting coffee. Water softener itself will not remove chlorine/ chloramine. Softening uses ion exchange technology to remove calcium and magnesium ions and introduce sodium ions into treated water. Similar to RO water, softened water will result in a flatter-tasting coffee. However, softened water will protect the equipment by preventing scale buildup. Table I: Pros and Cons of Water Treatment for Better Tasting Coffee and Equipment Protection Water quality differs for everyone since U.S. EPA standards only cover water quality at the plant level, but not the distribution system. Before buying a water filter, local water quality needs to be tested in order to determine which type of filter is needed. Disinfectant for chlorine and chloramine are not equal. Chloramine is more difficult to remove as compared to chlorine. A filter for chlorine removal may not necessarily remove chloramine. However, a chloramine filter will always remove chlorine as well. If water is soft (hardness less than 100 ppm), there is no need for a filter to remove hardness/ scale control. In general, most filters can remove sediments/particulates. It is generally best practice to have a filter certified by third-party laboratory. In summary, before buying a water filter for a coffee machine, test the quality of the water used to determine the levels of sediments, disinfectant, hardness, and TDS. When choosing a filter, flow rate, filter efficiency, and filter life are very important for a specific coffee machine. Replacement cartridges should be between 6 – 12 months in order to be cost-effective in regards to maintenance.